Being able to visualise cellular processes as they happen is seen as a critical part understanding what changes occur when disease strikes and how that process could be prevented, reversed or otherwise cured. For many decades, scientists have relied on using dye molecules that are absorbed into cells to visualise their behaviour. These dye molecules, originally adapted from the dyes used in the textile industry, have undergone development and improvement, but their basic principles and properties remain largely the same. A major drawback is dimming or fading of the dyes as they're exposed to the high-intensity light for imaging. Scientists have only a small window of time to image the cell, creating a snapshot of cellular events rather than ongoing, real-time tracking. Meanwhile, molecular imaging and microscopy have advanced to the point where super-fine resolution and real-time imaging is possible, not only at a whole-cell level, but within a cell and of its various components. This is inspiring microbiologists to team up with materials engineers to develop new luminescent bio-materials that, like an aircraft beacon, allow scientists to track and visualise cellular processes without adversely impacting the living cell. 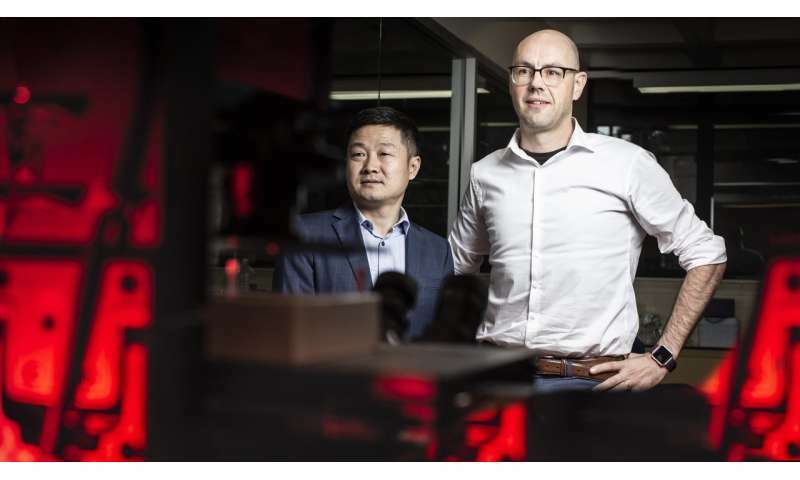 In a paper published today in the journal Nature Methods, researchers from the University of Technology Sydney (UTS) and the University of Wollongong (UOW), along with colleagues from Peking University, China, and the University of Göttingen, Germany, have outlined how light-emitting probes might be applied by life scientists in visualising cellular processes. Lead author Distinguished Professor Dayong Jin from UTS said materials scientists have made tremendous progress in the development of novel structures that are extremely small – comparable to the size of a protein molecule – that emit light with greater brightness and precision than classical dye molecules. "We can take nanomaterials, such as light-emitting plastic or ceramic particles, and deliver them to the site in question. Various other techniques help the particle to pass through the cell wall and we can visualise what is going on inside the molecular machinery. "We have noted advances such as the ability to measure the changes in transport within a neuron as a result of brain disease," Professor Jin said. "These advanced particles also make it possible to use different colours and pulse signals simultaneously so we can in effect visually barcode genes or proteins to see how these are translated and transcribed - the encoding of life itself. 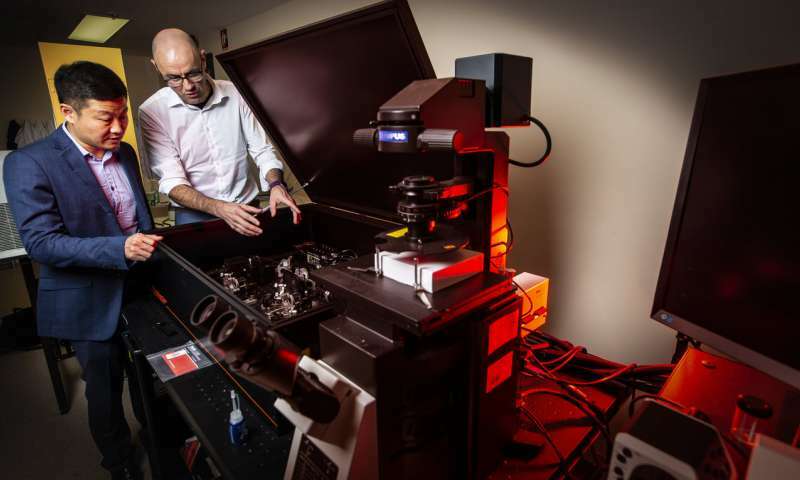 "This is an exciting time for the cell biology and materials science communities who now have an unprecedented opportunity to explore cellular imaging with unprecedented accuracy and resolution. Co-author Distinguished Professor Antoine van Oijen, who leads UOW's Molecular Horizons initiative, said the article highlighted how bringing the materials science community together with scientists from the life sciences would be critical in illuminating the intricate details of how life works. "Understanding of disease processes, and thus development of cures, relies on us understanding cellular processes: how do the various biomolecules inside our cells do their jobs? What happens when they stop doing their jobs properly and disease strikes? "At the moment, scientists and health practitioners are very worried about antimicrobial resistance, which could render some drugs useless and in a worst-case scenario, see the re-emergence of diseases that haven't troubled society for decades. "We're now at a point where researchers need to develop and produce new antibiotics, and doctors need to use them wisely. Understanding the processes of how drugs work at the molecular level is the key to developing these new drugs." These methods and the research collaborations that underpin them will be a key focus for Molecular Horizons, an $80 million research facility that is currently under construction at UOW's Wollongong campus. It will provide researchers with access to new tools for visualisation of biological processes that will help unlock the innermost secrets of the cell and develop new ways to detect and attack disease.